Mary Belle Smith, 1920. Mont Amoena in background. Memorial message from the class of 1938, Criglersville High School (Criglersville, VA), c. 1979. 1978 has ended. And the new one is in. Before it wears itself into too much busyness, we who have been your students would pause to remember you, Mary Belle Smith: effective teacher, good friend, confidant, and lady grand who always appeared impeccably dressed, like pink linen, and artistically clad, like yellow linen. You were our art lesson in reality and we appreciate your great sense of, and use of good taste. “Bare hands grip success better than kid gloves do,” you wrote up for us to diagram. It’s proven a truism – in reality they really do (grip success). (I doubt any of us had the kid glove experience, though, for those were depression years.) And while we learned the parts of a sentence and good sentence structure, we learned some of the lessons of life, for you chose carefully. And you had us in mind. You wanted us to identify with life (although that phrase was not in common use then). So from time to time you took a little detour and “let down your hair” and gave us the benefit of some of the things that happened around your home where you and your brothers and sister grew from childhood into lives of service. It really was fun learning what you folks did when unexpected company knocked at the door. We could identify and we did. “How do I know?” The room got hush! You knew that to identify the subject and the predicate was not enough. You knew as freshmen, all 21 of us, were not knowledgeable as one who writes profusely. Your job was to get us to glean facts and ideas and shape them into a set or sets of meanings (essay, you called it) so we could, what you’d now call, communicate. But, then, I don’t remember that phrase either. But nevertheless you taught us to recognize, to identify and to communicate! (Some of us talked more than we wrote – take Egbert, for example!) Else we got F in English. I don’t remember anyone who got F (I suspect all of us did on uncomfortable occasion), but I do know the 21 of us dwindled to a mere one dozen to graduate. And all twelve of us are saddened at your ’78 departure. We each said so in November (or was it late October?) at the Class of ’38 reunion at Mildred Dixon Ford’s. (What a lovely home they have, like Mary Belle Smith’s appearance, stately, the right colors, and properly framed!). And so Hazel and Mildred and Margaret and Jesse and Albert, and Ellen and Peggy and Rachel and Marie and Julia Belle, and Hilda and Louise (except Hilda and Louise couldn’t come this time) all wish you the best of fond memories and we hope your memory conjures up an excitement that was ours to know in four years of English classes; and may “each one teach one” as he was able to listen to you in the fall of 1934 on. Because there were too many students eligible to start school in first grade in 1928, the school ruled that a prospective student must be 7 by Jan. 1, 1929. Since my birthday is in April, I was unable to go to school in 1928. My mother, Lillie Rosser, taught me first grade subjects at home. When I started school in 1929, Miss Blanche Utz was my first grade teacher. Since I had already learned the subjects at home, I was promoted to the second grade after one month in the first grade. Miss Gladys Dulaney was my teacher and Ruth Finks was my desk-mate. We had a lot of double desks and a few single ones in each room. We learned the Locker Method of writing in third grade. We had to practice writing or drawing between the lines on our paper. After learning to write (in the style now called “cursive”), we were no longer allowed to print. Depending on the size of the third grade, it may have been divided between a room on first floor and one on the second floor or in a room with fourth grade. I was on the first floor. 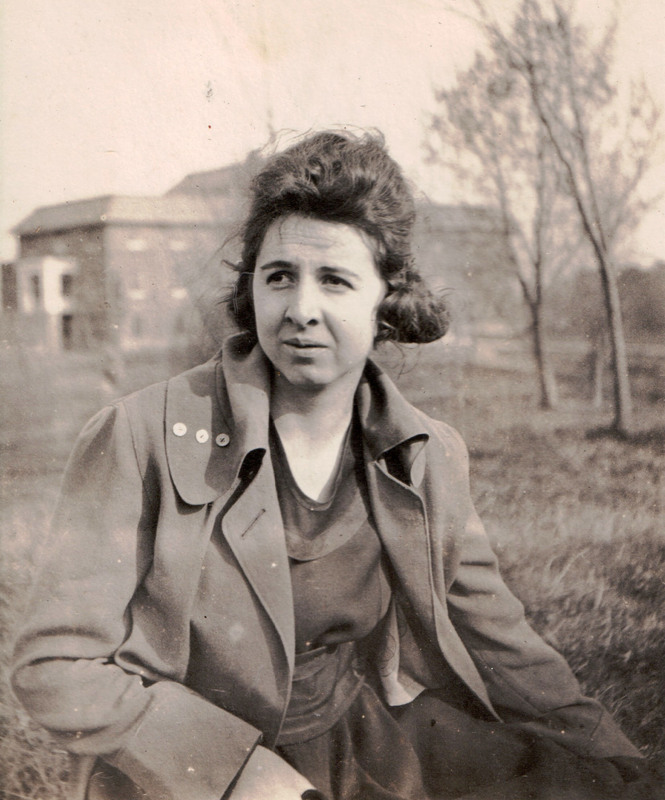 When I started fourth grade in the fall of 1931, we had quite a few new faces – one of whom, Margaret Carpenter, became my deskmate and best friend as long as she lived (2007). Miss Kathleen Lillard was our teacher; she was a graduate of Criglersville High School. One of our classes was Social Studies, in which we learned about many famous men like Columbus, Magellan, Balboa, Desoto and Ponce de Leon. This class and the Geography classes in school grades really stimulated my interest in travel. Europe was especially fascinating to me. I really wanted to go there and other places of interest, but I never thought I could. Only the wealthy “went abroad” in those days, but I digress. My husband’s parents came from what was the Austro-Hungarian Empire in Europe – around 1900. It became Czechoslovakia after World War I and is now the Slovak Republic since the break-up of Communism. This connection piqued my interest in travel even more. Finally, in 1979, we visited my husband’s ancestral home located near the Ukraine and on the Polish border – the town of Osturna. My dream to visit Europe was first realized when I was 52 years old in 1974 when my husband’s World War II outfit visited many battle sites in Europe including “The Battle of The Bulge” The group was the 7th Armored Division. My first cousin – Justice Call Dulaney from Peola Mills and also a graduate of Criglersville High School – was also a member of this division and lost his life near Metz, France and is buried at Hamm Cemetery in Luxemburg. I was fortunate enough to visit his grave. Since then, I have visited almost every country in Europe and Russia, Egypt and Holy Land and Jordan, a total of 36 countries. I have been truly blessed, I have also visited 45 of our 50 states, and also, in 2000 my heritage the British Isles. Please excuse this lengthy digression from what I set out to do. I did want to emphasize the importance of the Criglerville teachers’ influence on students by and through their methods of teaching and in their presentation of material. Miss Iva Huckstep taught fifth and sixth grades in a room on the second floor across the hall from fourth grade. Margaret and I remained deskmates through the seventh grade in Miss Florence Booton’s room on first floor. We did not have an eighth grade. Sometime around 1934 or 1935 the county made a decision to bus all high school students from the Brightwood District to Criglersville High School, because Madison High School was overcrowded. This affected all students who lived east of the Robertson (Robinson) River. So, the fall of 1935 saw quite an increase in our student population at Criglersville High School. We had five or six new additions to our freshmen class. Miss Mary Belle Smith was our homeroom teacher. She taught all English and French classes. I believe she would also teach German if enough students were interested. In high school we usually took four subjects each semester. Required subjects were two years of Math and four years of Grammar and English Literature. I can’t remember what other subjects were required. Other subjects taught were U.S. History, Government, Chemistry, Anatomy and Physiology, General Science, Algebra, Home Economics, Agriculture, Industrial Arts, Geometry, Literature and other languages. Miss Louise Renalds taught all the sciences, history and government. Miss Lucy Alice Davis taught all Math, Algebra and Latin. She was also the principal and what a disciplinarian she was! All three of these high school teachers were there from the time I started school until I graduated. I was blessed all through my grade and high school to have had wonderful teachers and also small classes where we received much individual attention. We had assembly of the entire student group each week when we sang and learned many songs such as “Juanita,” “When You and I Were Young,” “Maggie,” “I’ll Take You Home Again,” “Kathleen” and many others. Each room took its turn being in charge of the program for the week. Music was not in our curriculum. However, Mr. Moser came and taught violin, saxophone, drums and perhaps other instruments. Mrs. Waltina Miller, wife of our Agriculture teacher, taught piano. These were all private “pay” students. Mr. Moser had enough students playing different instruments to have a small orchestra. We performed at many of our school functions and also at other schools in the region. I believe it was while I was in grade school that a Home Economics house was built. Miss Geraldine Potts was the teacher. Also, an Industrial Arts Building was built. Mr. Bob Hloran was the teacher. Mr. Joe Miller also taught Agriculture in this building. I was president of my class. As such, I felt a responsibility to try to keep our small class together by phone calls. Planning reunions and letting everyone know when anything happened to one of us. This is a watercolor depiction of how the 5.7-acre county-owned Criglersville site looked in the late 1930s or early 1940s. It was created by Madison County artist Lou Messa. The main wooden building there burned down in 1940s, but was replaced by a more modern two-story brick structure, which is still there.